Personalized Thermos Custom Printed in Bulk. All Stainless Steel. Promotional, Very Inexpensive. Bargain Prices for USA and Canada. 25oz. and 32oz. Optional Vinyl Carry Case. Bulk sleek and stylish, custom imprinted thermos bottles with brush finish stainless steel outer shell. Budget Prices in the USA and Canada for wholesale personalized thermos bottles.Bullet shaped. Vacuum insulated double wall construction keeps liquids icy cold or piping hot. Single push button spout included for easy no fuss pouring. Plastic lined drinking cup. Prices below include your 1-color custom imprint. Add $0.50 per thermos for each extra imprint color. Free artwork design. We will send you a proof for your approval before production. Estimated Production: 10 days after art approval; please call for faster delivery. Maxam Stainless Steel 1 liter Vacuum Bottle. The slim styling, double wall construction and the push button pour valve makes this one a must have. Standing 13" tall, this vacuum bottle keeps your drinks cold or hot; cleans and stores easily. Setup: $80.00 per color, per side. Capacity: 32 oz (1 Liter). Imprint Area: 4" x 3-1/2"
Option: Black zippered vinyl carrying case: $0.79 each. 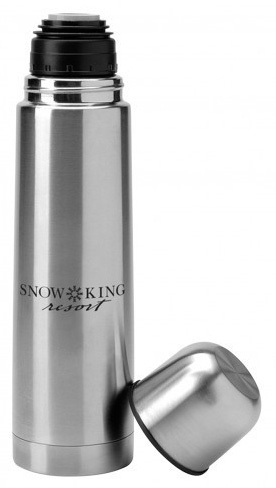 Description: Stainless flask features a 25 Oz. capacity. Lid can be used as a cup. Push button top for easy pour.